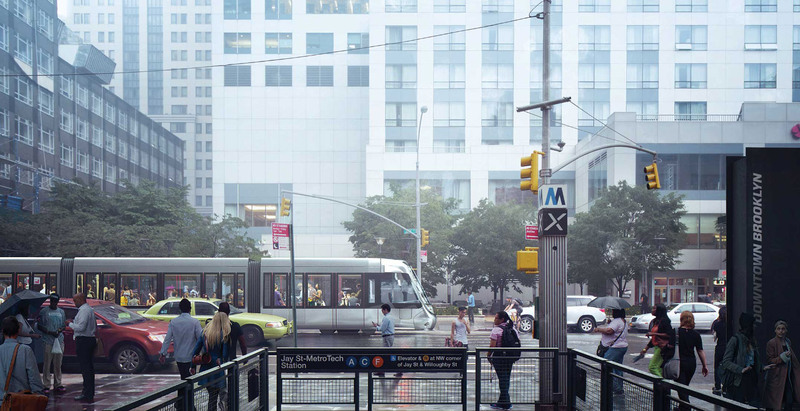 The saga of New York City’s proposed Brooklyn-Queens Connector (BQX) streetcar has taken yet another turn, as Mayor Bill de Blasio placed responsibility for funding the $2.5-billion project on the federal government. At an August 24 media roundtable, de Blasio dodged questions about how much the city would be contributing to the project and claimed that while a detailed BQX plan was incoming, federal subsidies were necessary to move things along. It looks like the federal government is throttling back its investments in mass transit, as the Federal Transit Administration has been consistently decreasing the amount of money allocated to intra-city projects. Still, it might not be impossible for the city government to secure federal funds for the BQX; the Gateway rail tunnel between New York and New Jersey, long maligned by President Trump, has seen a consistent trickle of money through Congressional action. While the city still has yet to release a draft report of the BQX’s route, there has been no mention of changing the 2019 groundbreaking. The de Blasio administration was (and seemingly still is) shooting for a 2024 completion date, but even if funding is secured in time, the reconstruction of the decaying Brooklyn-Queens Expressway could alter any previously proposed route. De Blasio added that details on the BQX’s next steps would be forthcoming. The nonprofit Friends of the BQX declined to comment.